A tiny shop near out-of-the-way Shindaita station, Bassanova would be easy to miss. Yet, this little 16-seat ramenya is home to some of the most unique flavor combinations to be found on Japan’s ever-evolving noodle scene. Step through the half-broken sliding door, slip a few yen into the ticket machine and sit down to wait for an unforgettable bowl of goodness. Bassanova’s green curry ramen is perhaps the most famous dish; however, the menu—aka the ticket machine—offers a varied selection of traditional and unconventional bowls. We opted for the green curry and the tsukemen to compare flavors (tsukemen, as one friend said, “is the crack of ramen. They’ve boiled it down to just the essence.”), the tom-yum soba, and Bassanova’s classic tondaku wadashi (pork muddy dashi noodle) soba. A side order of chahan (fried rice) and bottles of cold beer rounded out our selection. After handing over our tickets we settled in on well-worn stools at the stainless steel counter to watch the staff ladle and measure out spices and broth as well as swing strainers of noodles in a wide arc ending in a hard snap intended to remove as much water as possible before tipping them into the waiting bowls. True to its name, the tondaku wadashi soba arrived, its thin Kyushu-style noodles swimming in a thick broth barely visible under a healthy sprinkle of finely chopped negi (green onion), thick cut menma (bamboo) and delicate strings of hot pepper. The chashu (pork slice) was, as it should be, the star of this particular show. A thick cut of rolled meat and fat grilled to perfection, it veritably melted on the tongue. Bassanova’s thick, fish-based broth blends surprisingly well with a mix of Thai spices, conjuring a dish that is at once both distinctly Japanese ramen and Southeast Asian green curry. 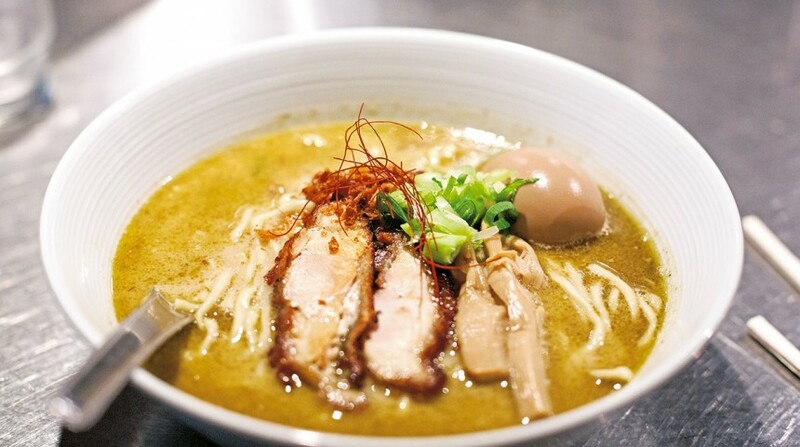 Legacy of a one-time collaboration with a Thai chef, both the ramen and the tsukemen offered a zippy yet subtle flavor that proved irresistible. One by one hands went up along the counter requesting kaedama, an extra serving of thick wavy ramen noodles, to slurp up the precious dregs. “Karai, karai! (Hot, hot! )” said another friend with already pink cheeks as she reached for a glass of water. Blazing red and perfectly spicy sour, her tom-yum soba came with the same thin, Kyshu-style noodles as the tondaku, with the addition of two still-sizzling grilled wonton on top. The chahan, made with that lovely grilled pork, finely chopped negi and strings of hot pepper, was tasty but tame in comparison to the noodles. Full to the brim and then some, we heaved ourselves up and out to make way for a fresh round of devotees that included three bespectacled hipsters presumably from neighboring Shimokitazawa, two rumpled salarymen and a lone construction worker in blue ballooning trousers. Easing the door shut behind us, we paused under the red neon BASA sign, already planning our next visit.